Perhaps the most gratifying event to Churchill during his brief tenure as Lord of the Admiralty was the destruction, forced by ships of the Royal Navy, of the German pocket battleship, Admiral Graf Spee, December 17, 1939, outside Montevideo Harbor, Uruguay. The sea action of this encounter is referred to as "The Battle of the River Plate." The most tragic event was the sinking of the battleship Royal Oak, with the loss of Rear Adm. H.F.C. Blagrove and 832 crew, while at her moorings in the British Home Fleet port of Scapa Flow in the Orkneys, Scotland, October 14, 1939, by the German submarine U-47. While the loss of this veteran WW I warship was not detrimental to the British superiority at sea, the moral effect was enormous. 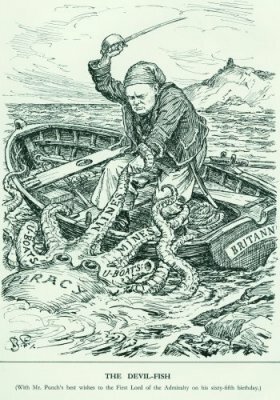 Churchill stated to Parliament, "This entry by a U-boat must be considered as a remarkable exploit of professional skill and daring." From the first month of the war, Churchill advocated mining the coastal waters around Norway, the winter route for exports of Swedish iron ore to Germany through the Norwegian port of Narvik; however, for the British Navy to do so would be a violation of Norwegian neutrality. Nevertheless, British mines were laid. In February 1940, Churchill authorized the seizure of the German ship Altmark, which was transporting British sailors taken captive months before by the Admiral Graf Spee and which had sought refuge in a Norwegian fiord. Hitler, in an act of revenge, ordered the invasion of Norway in April. The arrival of the German invasion force in early April caught the British by surprise. British and French troops soon were on the counter-attack of the German invaders, but the threat of German U-boats and air superiority thwarted any British attempt at success in the fool-hearty endeavor. A rout by the Germans of the British and French forces put ashore was on, and another �Gallipoli� appeared to be in the making. Much of the Norwegian offensive was associated with Churchill�s original plan to breech Norway�s neutrality and for which he quite easily could have received the total blame for failure. Churchill later was quoted, �Considering the prominent part I played in these events ... it was a marvel I survived and maintained my position in public esteem and parliamentary confidence.� On May 7th in Parliament, the blame for failure landed squarely upon Prime Minister Neville Chamberlain. Leo Amery, a member of Parliament and long-time Churchill friend (from their time together during the Boer War) and political ally, rose in the Commons to demand of Chamberlain, "You have sat too long here for any good you are doing. Depart I say and let us be done with you. In the name of God, go!" Chamberlain was forced to resign as Prime Minister and was succeeded by Churchill on May 10, 1940.